1.) Soda is packed with sugar. In fact, it’s like concentrated sugar, dissolved in a liquid medium that makes it invisible to your eyes and to your hunger-satiety system. Whether that soda has real sugar or high fructose corn syrup is almost irrelevant, because in both cases, your body is thrown into fat storing mode and your brain is put on high alert hunger mode. Even diet soda has this same effect on your brain, so you end up eating more than the calories you just saved by drinking the toxic chemicals replacing the sugar. And don’t get me started on those toxic chemicals because they can contribute to obesity and disease as much or more than the sugar they are replacing. 2.) Cereal is either made mainly from sugar or composed of fast carbohydrates that and up being turned into sugar inside your body 30 minutes or less after eating them. Just say no to cereal. It’s the lazy man’s breakfast and it’s not doing you any good. It’s only hurting you, making you sicker and fatter. It’s also doing that to your kids, so stop feeding it to them too. 3.) Bread is pretty much the same story as cereal. It’s basically just starch which is then converted easily and quickly into glucose, so eating a piece of bread, as far as your fat storage ability goes, is pretty much like eating a candy bar. There are several studies showing whole wheat, “ancient grains,” and cracked wheat can be healthy, but don’t believe them. Those studies were comparing these “healthier” breads to the “less healthy” breads like white bread and highly refined flours, so of course, the less refined breads turn out to be healthier, but they still encourage fat storage and are merely “less bad” than the more refined breads. 4.) Low-fat granola bars are typically packed with sugar or other fast carbs because the fat is taken out, so sugar has to be added in to make up for it. Fat makes things taste good, so when you take it away, you have to add something else in that taste good, which is usually some form of sugar. This is the case for most low-fat foods, regardless of whether they are disguised as “healthy,” as in the case of granola bars. And don’t be fooled by the term “organic” either. Lots of people think the word “organic” automatically means healthy. It doesn’t. It is of course, better to eat organic, but there’s plenty of extremely fattening organic foods. 5.) 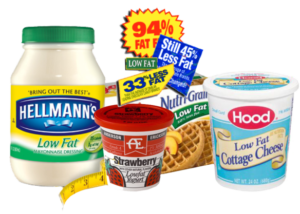 Low-fat yogurt (frozen or not) is also typically packed with sugar or artificial sweeteners for the same reason granola bars and other low-fat foods are, as mentioned above. 6.) Low-fat cookies are some of the worst culprits when it comes to cramming sugar in a processed food. You can make cookies yourself by following some of the recipes on hardbodcafe.com, but don’t bother buying any cookies, regardless of sugar or fat content. They are WAY over processed and have absolutely no nutritional value. 7.) Fruit is often touted as a healthy food, but modern fruit is nothing more than “nature’s candy.” The fruit we had 100 years ago did actually have some nutritional benefits, but since then we have bred it to be bigger, sweeter and to grow faster for corporate profits. This has slashed the fiber and nutrient content, while drastically increasing the fructose content, which is arguably the most fattening type of sugar. 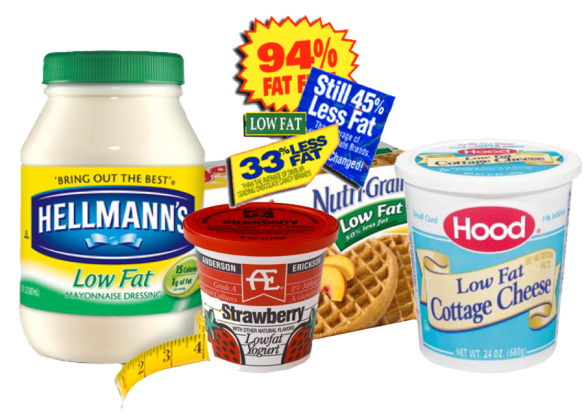 Low-fat foods almost always have high sugar (or other “fast carbs) to replace the fat. All high-sugar foods are fattening. Period. They typically make you hungrier too, so you end up eating more. Just say no to low-fat food. These foods are usually highly processed too, so that’s another reason to say no. If you’re lazy and don’t care about your health, then go for it, because it certainly is easier, but if you care about your health and the health of your loved ones you will run from it as if it was the plague. Take a little time for yourself and those you love by getting in the kitchen and preparing food with your hands, using real food ingredients, from local, organic sources whenever possible. Take a little time for yourself and those you love by getting in the kitchen and preparing food with your hands, using real food ingredients, from local, organic sources whenever possible.